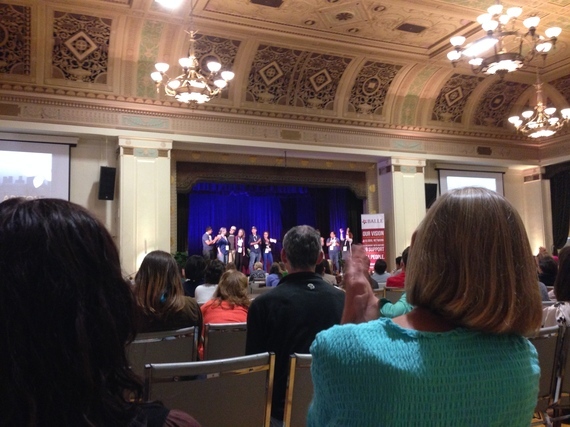 I'm just returning from the annual BALLE conference in Oakland. BALLE (the Business Association for Local Living Economies), is the fastest-growing network of sustainable and value-based enterprises in North America. It was founded some fourteen years ago, but the origins of this networked grassroots movement go back to the 1990s, when Judy Wicks, the founder of the White Dog Café in Philadelphia, decided to source and manage her café 100 percent locally and sustainably, using socially just practices. People loved it and it became a legendary success. But instead of turning her winning formula into a regional or national brand, chain, and eventually an empire, she decided to reinvest her profits in the health and well-being of her local community. She set up a foundation through which she taught everything she had learned to her competitors, using her money to help suppliers upgrade in order to serve all the cafés and restaurants in the region. When you look at the local living economy movement today, it's remarkable to see how much has been accomplished in just the few years since it began. Making our food cycles more local, sustainable, and inclusive has gone from fringe to almost mainstream in just 15 years. Next up for the localization movement: make investment, manufacturing, and production more local and sustainable (by moving money from Wall Street to bio regions, with 3D printing, etc.). As the Wall Street Journal wrote this week, entrepreneurs are turning to a new source of funding: their neighbors. What's next? Fifteen years ago the conversation was about localizing and entrepreneurship. Now these things are going mainstream. So what are the pioneers of the movement talking about now? What is the next frontier? What I picked up this week can be best summarized in two words: broadening and deepening. Deepening means creating room for the interior dimension of leading profound change: expanding the conversation about transformative leadership, mindfulness, compassion, sources of well-being, creativity, and spirituality. It means asking, Who are we today -- and who do we want to be tomorrow? 1. Place: reinvent how we deal with soil and nature. Instead of treating it as a commodity (that we buy, use, and throw away), treat it as an eco-system that we cultivate. 2. Entrepreneurship: reinvent our concept of labor. Instead of thinking of work as a "job," think about it as entrepreneurship powered by passion and compassion. 3. Money: reinvent our concept of and how we deal with money and financial capital. Instead of extractive, capital should be intentional, serving rather than harming the real economy. 4. Technology: reinvent how we develop technologies. Empower all people to be makers and creators rather than passive recipients. 5. Leadership: reinvent how we lead. Instead of individual heroes, we need people working together to develop a collective capacity to sense and shape the future. 6. Consumption: reinvent how we consume. Instead of promoting consumerism and using metrics like GDP, move toward conscious collaborative consumption and metrics that focus on well-being like Gross National Happiness (GNH) and the Genuine Progress Indicator (GPI, which is now being developed in about 20 U.S. states). 7. Governance: reinvent how we coordinate. Move away from being limited to the old three mechanisms, hierarchies, markets, and negotiation among organized interest groups, and move toward a fourth mechanism that operates through awareness based collective action (ABC), through seeing and acting from the whole. 8. Ownership: Advance the old forms of state and private ownership by creating a third category of ownership rights: commons-based ownership that better protect the interests of our children and of future generations. But what is the animating force that could move this ego to eco shift from small seeds to action? What I saw in the BALLE conference, and what I am seeing in various other places across the planet, is that something begins to grow together that belongs together: the power of entrepreneurship -- and the power of the awakening intelligence of the heart.